Install the cool new Calculator² app. Pin the Calc program in Metro UI screen. Add Calculator² app to Metro UI. Calculator² is a smart calculator with 5 different modes: Basic, Scientific, Programmer, Currency Converter and Unit Converter. To switch modes, just right click any where on the screen and the mode selector will come down. Calculator² is easy to use with large buttons, clutter free interface, scientific functions, constants and history for all operations. An interesting feature in the basic mode itself is a customizable tax button to calculate total price including tax with a single click. The currency converter is another feature which can be real handy. It features more than 150 currencies which you can convert between each other. Tip: To change any calculator setting like tax rate, just move your mouse to top right corner of the screen to bring out the charms menu and select settings. Pin Calc Program to Metro UI. Bring your mouse to the top right of the screen and from the charms menu that comes up, click on "search". Type in "calc" and the calculator will appear on the left. Right click on it and from the bottom menu that comes up, select "Pin toStart". 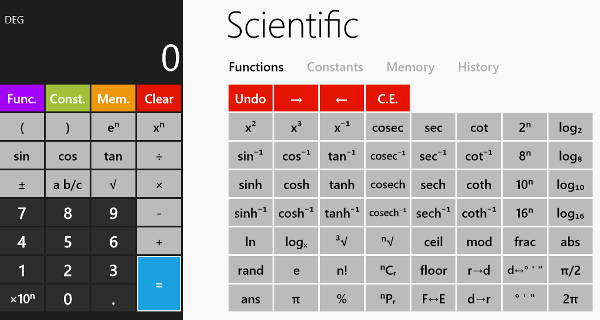 That's it, you will now have the calculator in a new tile on your Metro UI screen. The Calculator app deniability packs more power and functionality than the inbuilt windows calculator. It's bigger interface is more easier to use as well. It comes completely free supported by ads and you can get rid of the ads by buying the pro version for $1.99. Top Best Free Antivirus For Windows 8 - Review. Speed up Slow File Transfer between Your Android Phone and PC, iPhone. 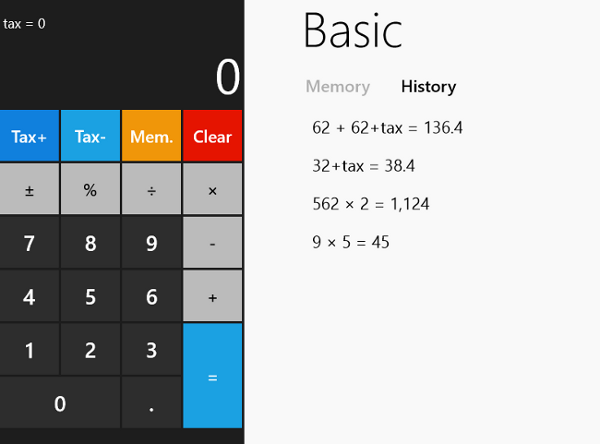 Looking for a calculator app on your Windows 8 Metro UI startup screen? Calculator² is the best calculator app you want.